Issue #116 was the first issue of my brand spanking new subscription to The Flash to arrive in the mail. Upon getting off the bus from school each day, I’d pick up our mail at the box by the road. There wasn’t a bad day born that couldn’t be instantly turned around by the sight of one of those plain brown wrappers in which the issues used to come wrapped. The issues were mailed folded which was a little unnerving since that was something I wouldn’t have dreamed of doing. Sometimes I’d see another kid with a folded-up comic book in his back jeans pocket, and all I could do was shake my head in pity. I couldn’t imagine living like that. My first two issues of The Flash were already stored in a perfectly sized box that my dad had given me. As a kid himself he had ordered a collection of Robert Louis Stevenson books and that was the box they came in (it even had “Batiuk” already written on it which saved me some time there), and now it was storing another generation’s treasured works. I never ever believed in artificial distinctions like high art or low art. Art is art and if it looks or sounds good… then, in my book, that’s all you need to know. The failure to observe those barriers would one day become somewhat problematic for me, but that day was still light years away as I lay on my bed reading my new issue of The Flash. And it was a pretty good issue at that. The first story opened in a classroom at an Institute of Advanced Learning on world 86 in dimension 24. Teacher Elider was showing his class a simulacrum of Central City. The story hangs its hat on the the fact that the simulacrum is an hour ahead of time on Earth which essentially turns it into an inter-dimensional time-travel story. A janitor turned crook at the afore mentioned institute uses the time gap to amass wealth on Earth and the Flash uses his super speed to affect a nice twist at the end of the story. 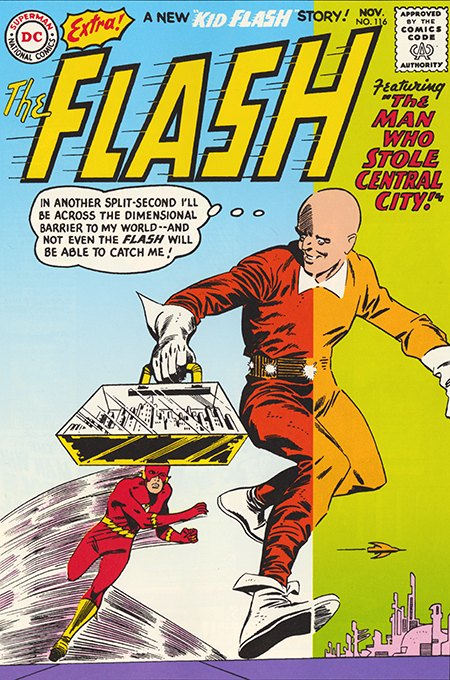 The second story is a Kid Flash piece about encountering some crooks while on a road race with his dad. It’s the kind of story that was intended for kids who carried folded-up comic books in their back pockets. Two other elements in the book attracted more of my attention. One was a house ad for the Justice League of America. The DC house ads were calculated to make you ache to get your hands on those books. “Just imagine!” the ad started out and boy did I! Given the limited distribution of these books, they seemed like alien artifacts from another world that you could only dream of possessing. And, once again, I found the letters column to be a font of information. First there was a letter from Roy Thomas in Jackson MO (This is the same Roy Thomas I would encounter at Marvel when, right out of college, I first went to New York to make my stand. He beat me there.) . He talked about an earlier Flash who wore Mercury’s silver winged cap. News to me. He also asked for the return of some earlier characters called Winky, Blinky and Noddy, and suggested some costume changes for Kid Flash while opining that the Kid wasn’t quite his cup of tea (See? What have I been telling you?). As ever, Julie Schwartz paid attention and would eventually give both of these suggestions a shot in the book. In an answer to another letter, Julie would explain some terms of art such as what a splash page, symbolic splash page and trailer were. My education continued apace.